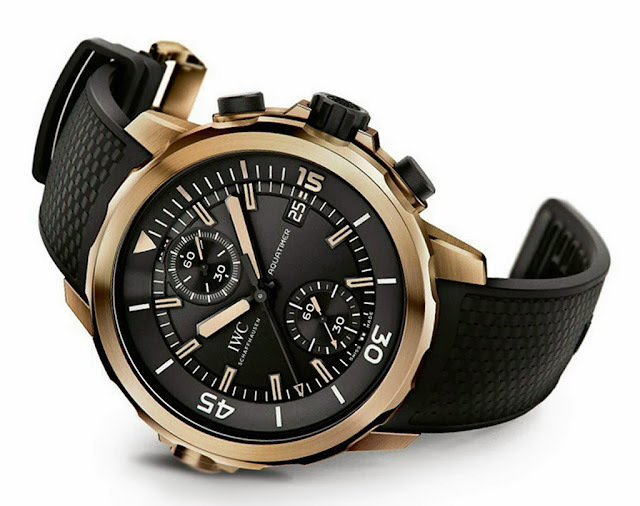 IWC has got us used to collection-themed SIHH (Salon International de la Haute Horlogerie) events: after the year of the Pilot line (2012) and the year of the Ingenieur (2013), it looks like 2014 will be the year of the Aquatimer. In fact, we have a preview of three new Aquatimer diving watches that will be presented in Geneva next January. 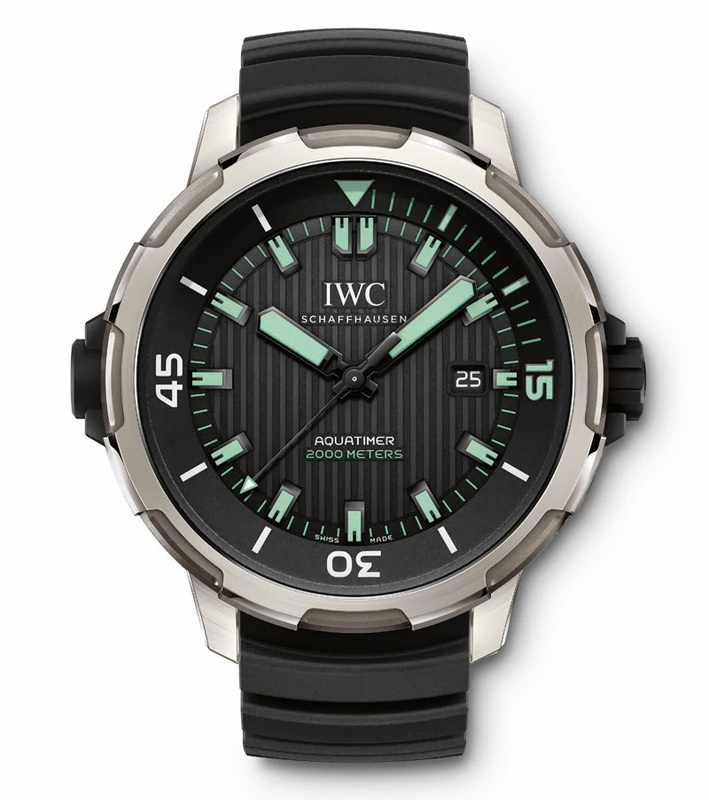 The Aquatimer line was introduced by IWC in 1967 soon becoming one of the most successful diving watches ever. It was pressure-resistant to 20 bar and equipped with an internal rotating bezel showing dive time controlled by a second crown at 4 o'clock. The most evident novelty of the new 2014 Aquatimer line is represented by the inner graduated scale for calculating the time of immersion whose rotation is controlled by the outer unidirectional rotating bezel, easy to handle thanks to its knurled edge. According to IWC, this solution is not only easier to use but also more reliable. The first preview model is the Aquatimer Automatic 2000 (ref. 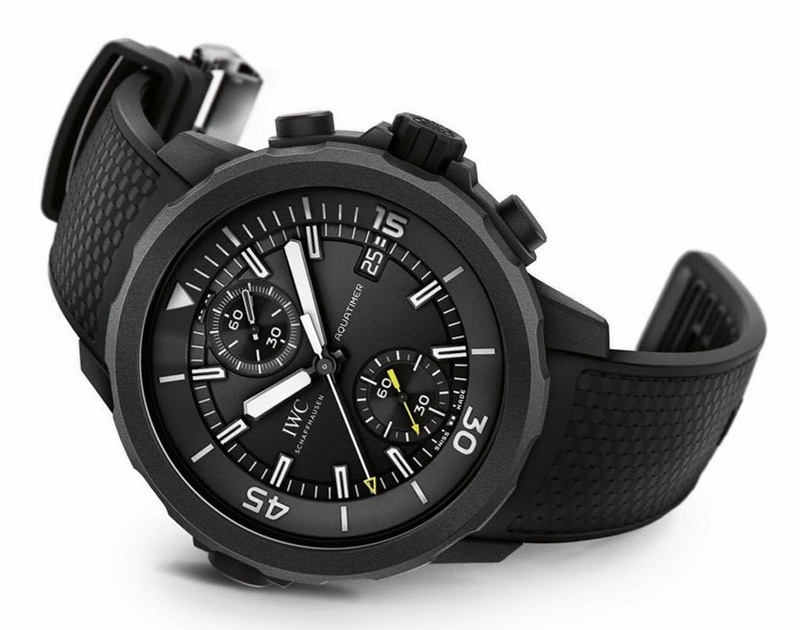 IW358002) in titanium, a three-hand model that is water resistant to 200 bar or 2000 metres. Inspired to the Ocean 2000, an iconic IWC diving watch dating back to 1982, the Aquatimer Automatic 2000 adopts the in-house movement 80110 with Pellaton automatic winding. The case diameter is 46 mm. The thick coating of Super-LumiNova, used for the hands, the hour markers and the inner graduated scale, guarantees that the dive time can be read off even in adverse lighting conditions with poor visibility. For even better readability, two colours are used: green for the immersion related indications, blue for the hours. 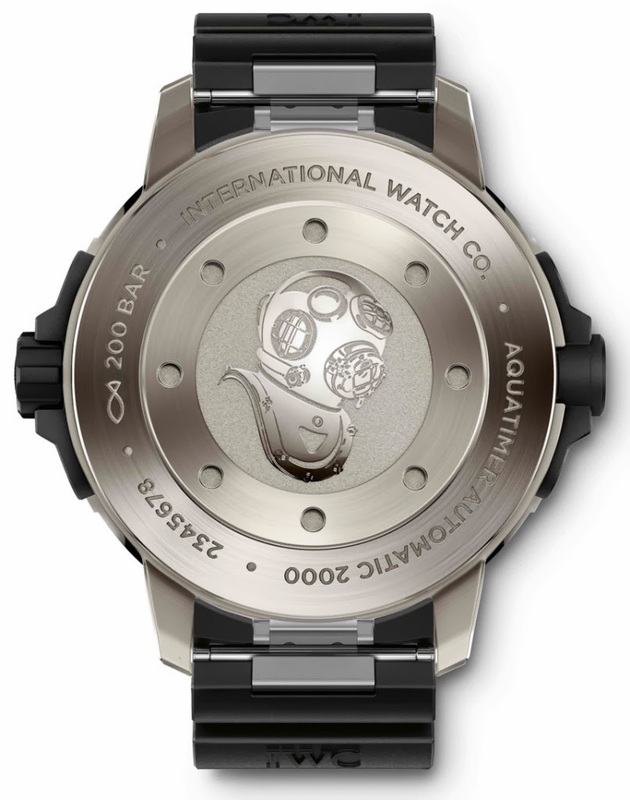 The second model is the Aquatimer Chronograph Edition "Galapagos Island" (ref. 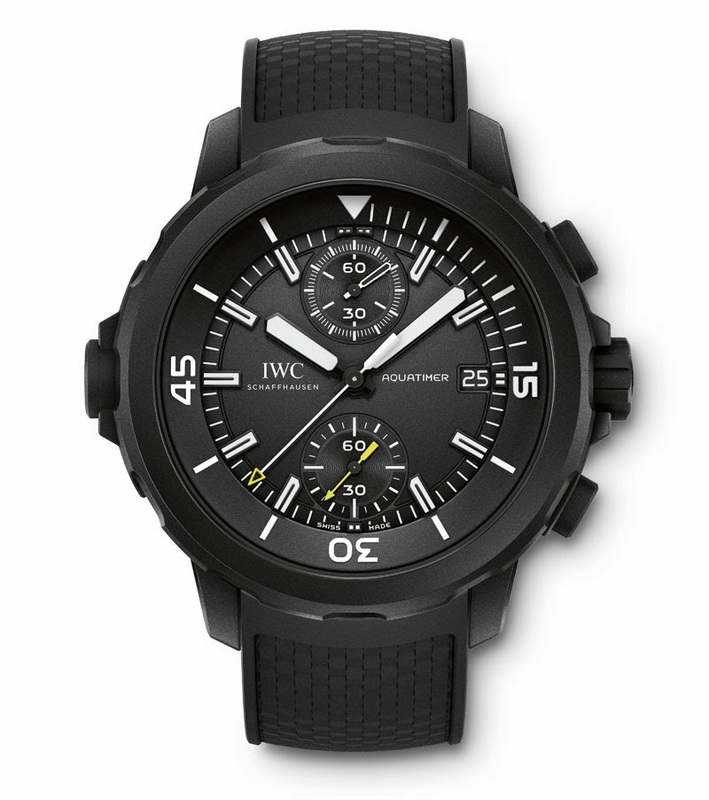 IW379502), with a stainless-steel 43 mm case undergoing a complex vulcanisation process that leaves it with a matte-black rubber coating. Movement is the in-house calibre 89365. 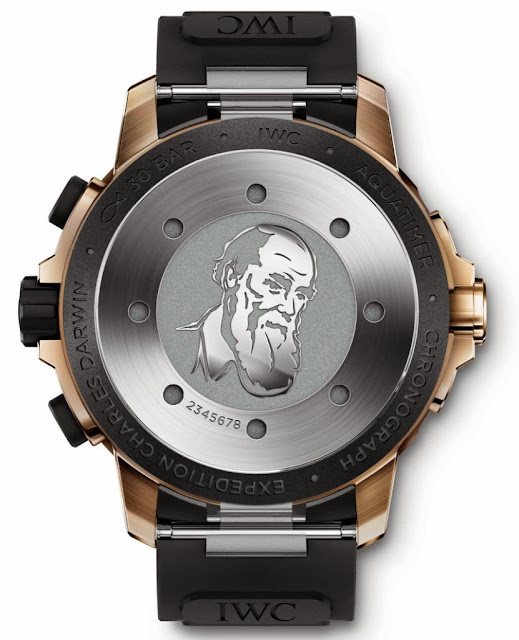 For the third model, the Aquatimer Chronograph Edition "Expedition Charles Darwin" (ref. 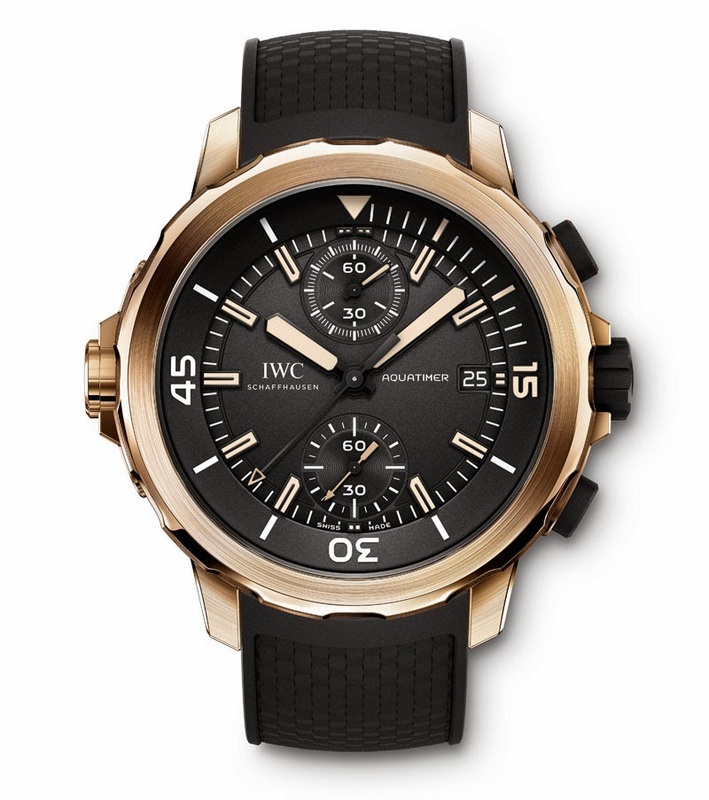 IW379503), IWC decided to use bronze for the construction of the 43 mm case. It is the first time that the Schaffhausen-based manufacturer employs this metal, more resistant to corrosion than steel. All the new Aquatimer models adopts a bracelet quick-change system that IWC has developed under a patent license from Cartier. Other Aquatimer models will be unveiled during SIHH 2014, including the Aquatimer Digital Perpetual Calendar Date-Month (ref. 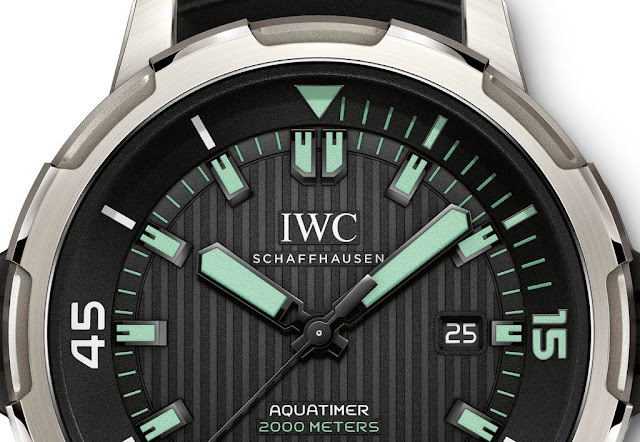 IW379401), the Aquatimer Deep Three (ref. 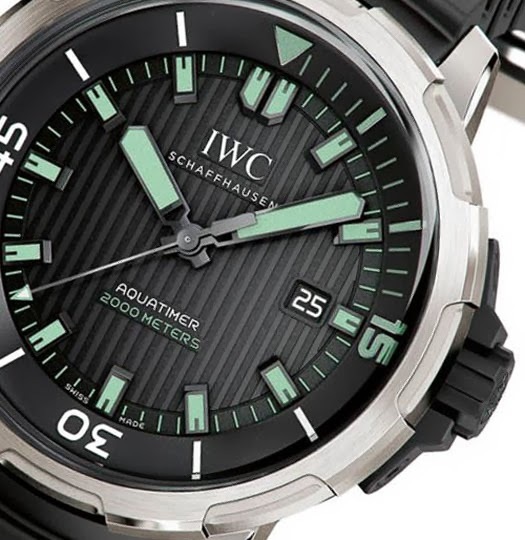 IW355701), featuring a mechanical depth gauge, and the entry-level Aquatimer Automatic available with black or silver dial in a 42 mm steel case. More details in few weeks. 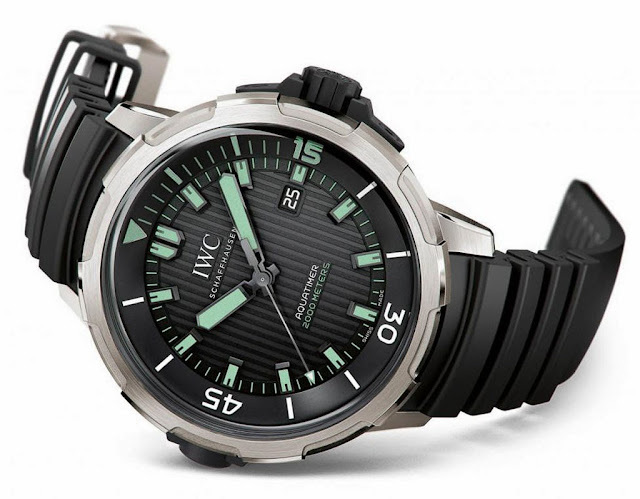 Read about the IWC Aquatimer Automatic. IWC has got us used to collection-themed SIHH events: 2014 will be the year of the Aquatimer. The first preview model is the Aquatimer Automatic 2000 (ref. IW358002) in titanium, a three-hand model water resistant to 200 bar. 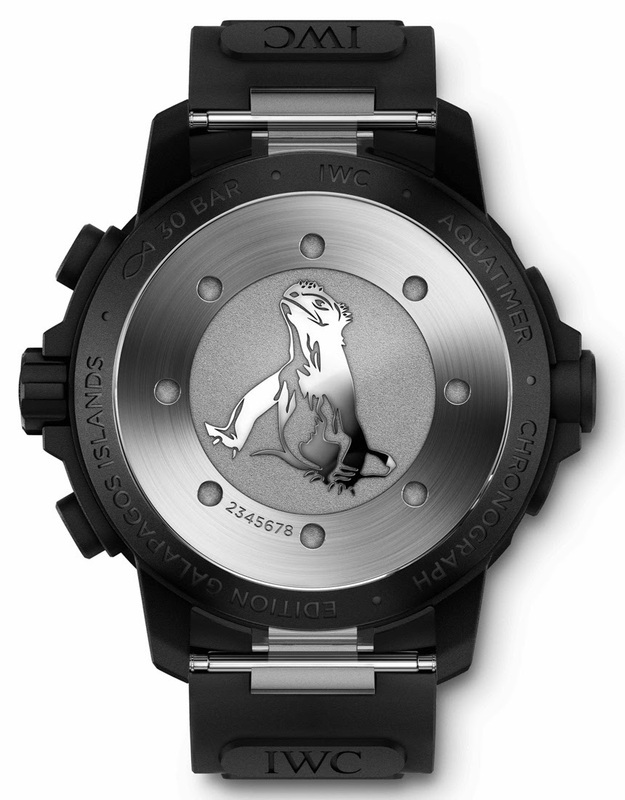 The second model is the Aquatimer Chronograph Edition "Galapagos Island" (ref. IW379502). For the third model, the Aquatimer Chronograph Edition "Expedition Charles Darwin" (ref. IW379503) IWC used bronze for the case.